At the mercy of Sandria Darque! As Master Darque fights to return to the land of the living, his former disciple - the deadly assassin Roku - will build an army to put him down for good. But not even the Shadow Seven - the underworld's deadliest cabal of murderers and mercenaries - will be enough to assure victory. To truly defeat an undead lord of death and resurrection, she'll need the complete and unquestioning allegiance of Ninjak...who isn't interested. But when Darque's long-missing sister Sandria returns with a gambit that could reveal his greatest weakness, an unholy alliance of light and darkness will be forged that could upset the balance of good and evil once and for all time? 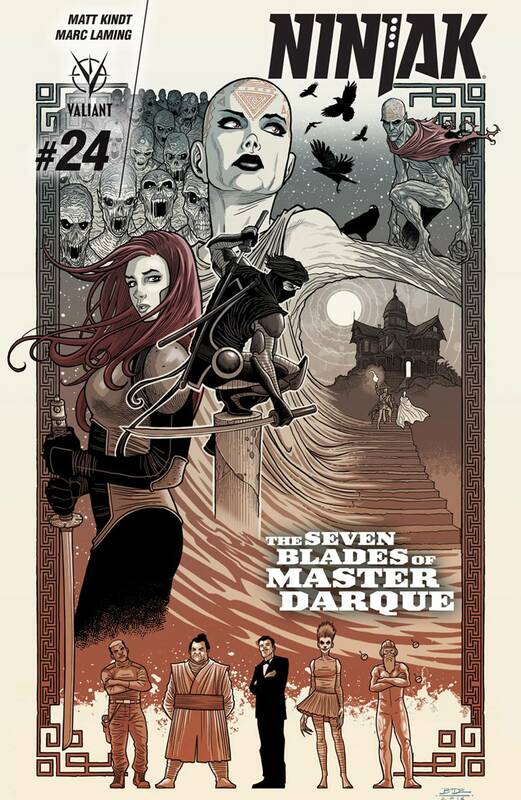 'THE SEVEN BLADES OF MASTER DARQUE' strikes again as New York Times best-selling writer Matt Kindt (DIVINITY III: STALINVERSE) and acclaimed artist Marc Laming (Planet Hulk) bring the biggest Ninjak story ever to a dark and terrible boiling point? and reveal the ultimate secret behind his greatest foess!